Left to my own devices, my style of crafting and making is exhausting. I say this with a twinkle in my eyes. First there’s the comprehensive combing of the internet for an example of the project I have in my head. Then there’s the daily (hourly?) contemplation of when will I have enough time to work on the project. Because there are so many other virtuous things I should be doing (dishes, taxes, exercise, making another connection to build my business) besides engaging in pure creative delight. And then, finally, when I’ve committed to going forward, there’s the careful stewardship of my materials. Some might call it thrifty. Others, miserly. This is who I am. I’m 40 years old and I’ve done some work to be aware of when I’m making things harder on myself then they need to be. I know when I’m letting the my own nutty rules run the show and when I need to tell them to take a hike. So it’s cool. What’s not cool is when my rules and shoulds gets all up in my 3 year old’s business of making and crafting. Can you hear the joy just getting sucked out of it? And for all my awareness of when I’m controlling and optimizing things, I have triple the awareness and a deep commitment in my heart that I don’t want to show my kiddo this is the only way to do things. So my 40-year old self has to check all her shoulds and rules at the door, and get down on his 3 year old level. And it’s not just getting down to be with him, it’s getting connected to the kid I was when I was his age. I have to remember how fun it was to squirt glue in never-ending loops and curlicues, until the paper is almost soggy. The satisfying sound of dumping dry rice and corn out of containers and squishing fingers through cold paint. Cutting paper because it feels powerful. Living by the adage that more is most certainly better when it comes to googly eyes, pompoms, and beading jewels. I have to remember what it means for a child to make and craft on his own terms. So what happens by dropping all the rules and shoulds? And what have I learned for myself? At my house we make and craft more frequently and in shorter pockets of time than I would have ever imagined. I’ve learned that sometimes 10 or 15 minutes is all it takes to build something or create a collage or measure and mix up some ingredients for muffins. And that’s helped me realize that I don’t have to set aside an hour for my own projects. With intention and purpose I can sew a small project or make a few notecards in a 20 or 30 minute window. I’m super present. When I’m not trying to micromanage, I can just be with him and explore with him what happens when you dunk your painting sponge into every single color available … at once. He’s leading me in what he wants to do – I’m kinda of not in charge. So I get to quiet down my brain and get recharged. One of my favorite days, when I really was able to let everything go in the rules and shoulds, was a few weeks ago with my son and his friend. I had a small stash of some dried grains that had outlived their prime and I imagined the boys could draw with glue on paper and then sprinkle the grains over it to see what designs stood in relief. I offered that suggestion to them and then sat back. For ten minutes they glued and sprinkled and colored intensely on pieces of construction paper, silent and immersed in their work. And I just watched as the glue puddles got bigger and bigger and the piles of rice got taller and taller on the paper. I wasn’t sure the construction paper could support the moisture and weight of the emerging sculpture. And then in a final flourish, the friend squirted even more glue on top of a rice pile on his project, laid one last piece of paper on the glue, gave it an anchoring little pat, and looked up with a supremely satisfied smile on his face. His artwork was covered up, obscured by the final piece of paper, but it was clear that the joy wasn’t in the finished product. It was in the freedom of making a mess, of going overboard, and not having someone tell him to do it any differently (as much as she wanted to ;) ). Kate is a personal coach who supports people to quickly and powerfully start living the life they want. She lives in Seattle with her husband and two kiddos. Prior to becoming a mom, she spent her free time hiking in the Cascades, distance running, and cooking for friends and family. Things look a little different now but she and her husband are getting back into the swing of outdoor life, albeit with sunrise hikes and stroller runs. And Kate is pretty proud of her newfound skills as a short-order cook for the under-4 crowd. As much as I've enjoyed sharing my favorite DIY projects with you in January, February, and March, I decided it was time to get a little more personal. We've owned our condo for 4 years now. We originally thought it would be a starter home, but we've fallen in love with our lives here. The location is unbeatable, and we truly have all the space we need, at least for now. Since we decided to commit for the long(er) haul and don't need to keep our place resale beige anymore, we've gone wild with personalization projects. I've shared a few on Instagram, like the chalkboard wall in the kitchen or my graphic color-blocked office walls. The bigger the impact:effort ratio of the project, the better. (Don't think I've forgotten you, popcorn ceilings. Your time is coming...just not now.) Which is why we decided we would liven up our white folding laundry closet doors. They are the first thing we or guests see when they enter our unit, so they made a great candidate for a bold statement. Because what matters most in design is not doing it "right," but creating a space that feels like home to those who spend their time there. Step 1 was to tape on our design. Here it is, mid-process. In hindsight, it was kind of a pain to figure out left and right to realign the doors. We wished we had left the doors on their hinges for this step. Here they are! Well, sort of. We did one coat and learned that it's tricky to get a smooth, even surface and crisp line edges using our standard paintbrushes or wall rollers. We're going to need to do some touch ups. Aaaand, here they are in our entry way! This is the first view we and guests see when we walk in the door, so it's wild/nice to have such a bold color. It definitely meets our goal of personalizing the space though. I mean, we don't think our kid is like some kind of artistic genius or anything...but at the same time we kinda do. ;) Little kids are always able to make the most awesome abstract art. We can't wait to display this stuff. So thanks, Blue, for saving Mama and Daddy lots of money on art for our living room. Here's my favorite photo from another family that did a similar project. The white squares seem to give a nice base for a growing collection. What projects have you been working on or wanting to work on lately? Share in the comments below. Every Tuesday evening my Mom attended craft classes. She spent many late nights sewing clothing for me and quilts for her bedroom. She created ribbon embroidery pieces so exquisite, that my Dad later framed each piece and proudly displayed them around our home. Our mid- century house was not spacious or perfectly manicured but it told a creative story of a family of makers. Art littered every wall and our pieces became conversation starters amongst visitors - family and friends, old and new. I enjoyed being a maker and my childhood creativity was inspired much by my mother’s pursuits of art and crafts. I painted on tile, knitted a stuffed toy elephant, experimented with decoupage, and intricately strung swarovski crystal beads into wristbands for elegant watches. My Dad also had a flair for art, colors and textures. After an early retirement he invested in a small framing gallery, where he specialized in choosing the style of frame and mount boards for original artwork or prints. As much as I appreciate my parent’s artistic influence in my life, for the first year of my daughter’s life I shied away from the messiness of creative life and toddler art and chose not to incorporate art into our days. All the early childhood development literature points to the importance of parents allowing children to get messy because children are fascinated with art that encapsulates all of their senses. The learning benefits that can take place when a child creates art is wide-ranging. Art can build self-confidence and grow self-expression, just as much as it promotes fine and gross motor skills and coordination. At 14 months, it took my daughter a while to grasp the concept of painting with a paintbrush or her pudgy fingers. Instead she would reach for a handful of paint and gleefully place it in her mouth to eat. The thought alone of her eating paint was enough to dampen my hopes of an afternoon of art-making. I think my aversion to mess and lack of patience was the culprit. Until one afternoon in the early summer I gave her a bowl of water, a paintbrush and watched her on our sun-lit porch as she “painted” our balcony with great joy and precision. I was delighted in her delight. That afternoon, I drove to Fred Meyer and bought her first set of Crayola washable paints and a long-sleeved art smock. Sometimes our little makers have a lot to teach us. We both needed a little color (and mess) in our lives. Sometimes I feel a pang of Mom guilt for not introducing art to her sooner, but it’s never too late to begin. For the rest of the summer, she rose before dawn, anxious to get outside and paint. For some children, mess is distressing but in those early days of mothering and introducing my daughter to art, I was the only one distressed. She comes alive when she is able to draw, paint and create. Painting outside lessened my concerns of having to clean paint off of our black and white striped couch, her cute clothes, and the living room walls. Today, our favorite place to paint is still outside, under our birch tree, cooling off under the shade of our evergreens. We also enjoy painting at our neighborhood community art center, Seattle ReCreative. The store hosts a “paint playground” every weekday morning geared for little makers between the ages of 1 and 5 years. On our first visit, her eyes lit up when she saw the paint and glitter and her mouth widened in amazement as she mixed colors together. Leslie Bushara, deputy director for education at the Children's Museum of Manhattan writes about ways to inspire creativity in your young children. “Prepare for a mess. Set up an art space where your kid can be free to experiment (and get messy!). Throw a drop cloth or a newspaper on top of your kitchen table or in the garage. If weather permits, let kids paint outside. Avoid giving direction. Instead of saying, "Paint a rainbow," encourage her to "experiment with mixing colors using different types of brushes and paper," suggests Bushara. If you’re needing a little inspiration, I recently read an insightful book, The Artful Parent, Simple Ways to Fill Your Family’s Life with Art and Creativity and it has over 60 art projects for children 1 to 8. Now in the winter, I bring our backyard art studio into our home, leave behind expectations of what art time will look like, cover our oak table with newspaper and we get messy. One of my least-favorite parts of cross stitching used to be figuring out what to do with my work once I was done. The shift between the meditative, peaceful process of stitching and the "now what?" part was jarring. I felt like my momentum was slowed to a halt. It's enough the turn me into an Olympic-level procrastinator. Can anyone relate? Fortunately, now that I frame most of my pieces in the hoops I used to stitch them, the process has become much faster. I like this method and the finished result so much that all of my kits come with an appropriately-sized hoop. Double check to make sure your design is centered in the hoop. Cut off the edges to round the Aida, leaving a 1-2" border. Use a running stitch (like a dotted line) to make a border close to the perimeter. I use a few strands of strong thread. Cinch the thread to close the circle and secure with a knot. If you're giving the hoop as a gift, this is a good time to stitch or glue a round piece of felt onto the back to cover it. Totally optional. Replace the outer hoop and hang your work somewhere where you'll get to enjoy it. What parts of cross stitching slow you down or otherwise keep you from making as much as you want? Share below in the comments. Happy March! It feels a bit wild to go directly from snow to seeing flowers in bloom, but I guess that's what spring will do to ya? Here's my monthly list of Pinterest faves, largely inspired by that GSD feeling brought on by a weekend away. 1. 17 Hanging Herb Garden Ideas for Small Spaces! I'm not trying to brag, but we have three balconies. And a front porch. Condo living is our jam right now. I feel like I should have a pretty sophisticated balcony gardening game, but each one has a roof that extends quite a bit, so I always struggle with getting my plants enough sunshine. <Writing that sentence makes me wanna say, "Duh, silly. Go for shade-loving plants." But some of my favorite edibles love the sunshine! Now that it's time to start thinking up my spring/summer planting, I was drawn to this article called "17 Hanging Herb Garden Ideas For Small Spaces!" Oh yeah...there are more possibilities for going vertical besides setting pots on the deck railing. Love it. For years, we've known we wanted to personalize our dining wall. But what to do? Plank wall? Wallpaper? A bold color? Whoever picked the lovely cool beige was truly a genius. The color works well throughout our home. But we're not moving anytime soon, so the time to embolden our space seems to be now. The solution we've been daydreaming about is to install pegboard. This photo helped me to pick exactly how. Black and floor to ceiling. This is happening. Tell me I'm not the only one who finds the colorful swirls of subway or train maps to be dreamy. They make me want to take an adventure. 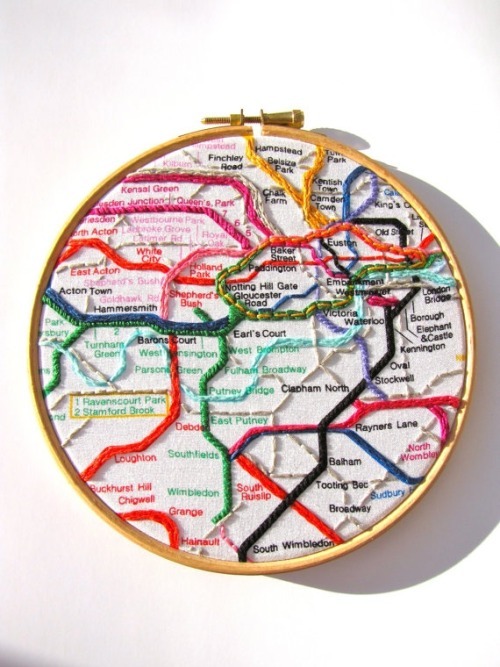 This is the London Underground, but anyone could make one for their own beloved city using some fabric and thread. If you want the look but don't want to actually stitch it, mirrymirry sells it on Etsy, too. Here's another project that you could DIY or take advantage of the pre-made version. 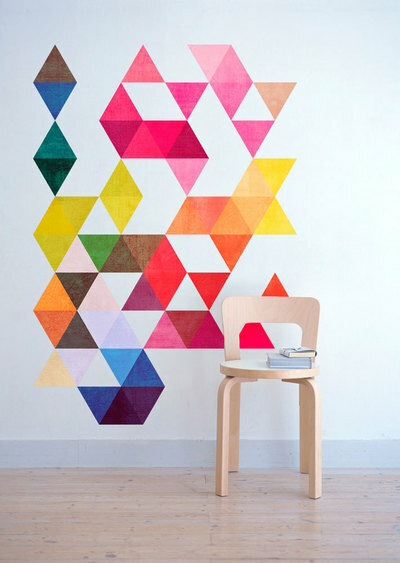 This is a wall decal, but I might steal the idea to hand paint some full-sized closet doors in our entry. The space is begging for some personality. This is the simplest font I've ever found that is still really elegant. I know this isn't a complete project idea, but it could work to personalize any stitching project. What have you been making lately--or wanting to make? Please comment below to share. And if you decide to tackle any of these projects, please take lots of pictures! I'd love to feature you in a future post. Stitching is really relaxing but sometimes the process of gathering all of the needed supplies is a hassle. DryGoods Design in Pioneer Square always inspires me. Photo and feature by CraftyPlanner. Below is a list of some of my go-to spots for supplies. These categories are listed in order of my preference. DryGoods Design in Pioneer Square--this place is like a candy store for stitchers. 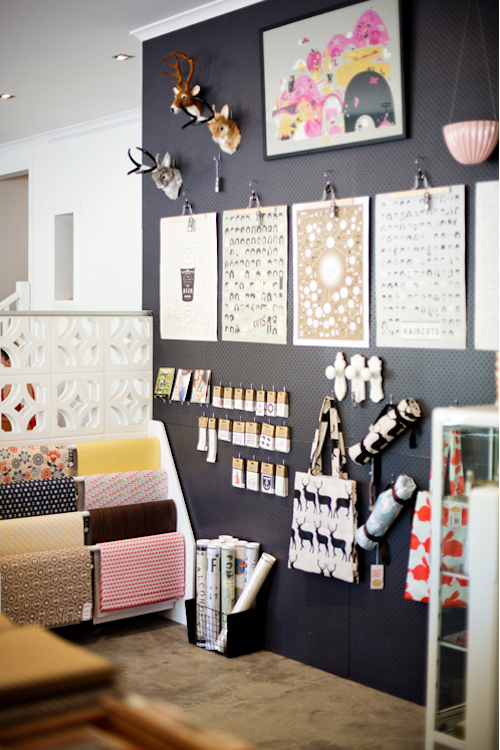 They have a smaller but gorgeously curated collection of fabrics and other supplies. Esther's Fabrics on Bainbridge--big selection, and I don't mind using Esther's as an excuse to take a relaxing scenic ferry ride across the sound. Big box stores--If I need something right away and can't get it though small businesses, my final option is to try JoAnn or Michaels. I ended up sourcing my bamboo hoops though Michaels. They have a huge, comprehensive collection and almost always have sales going, so it's worth trying to time your purchase with a discount. Tell us below: what are your favorite go-to spots for stitching supplies? Should I Buy My Favorite Design as a Digital Pattern or a Kit? Use this flowchart to make key product decisions that will get you making faster.